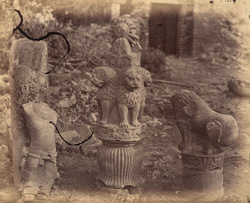 Photograph of a group of sculpture fragments lying on the ground at Sanchi, from the Archaeological Survey of India Collections taken by Joseph David Beglar in the 1870s. These fragments are a capital with four lions seated back to back, a pillar, a torso, and a broken lion capital. They are some of the antiquities found at Sanchi and belong to the 3rd Century BC, Maurya period, the earlier phase of the Buddhist site.